This fine morning, sick of looking at the screen, I grabbed my goodies and on a whim headed off to Birmingham. There was one cemetery that I had my beady eye on as I had read about it, so it was probably my primary motivation for a day trip. But anything and everything in between was fair game. Hold onto your hat, we are at New Street Station! The station is a mess, they seem to be doing something to it, but I have no idea what that may be. It does involve scaffolding though, and high-vis vest clad workers. But the station really has nothing interesting or exciting about it. The sooner I left it the better. My route would take me up to the Town Hall area, to the Hall of Memory, and then up towards my destination further on. It was probably 9.30 by the time I got there, so the city was quiet at the moment. In fact I was glad that it was quiet because I could then photograph the really magnificent Council House Building in Victoria Square. It is really a magnificent structure, and has to he seen to be believed. Even Queen Victoria looks impressed, although what she would think of this lady in the fountain I will not ask. The large square colonnaded building below is the Town Hall, and this is the back of it. Naturally I did not realise that at the time. The ornamental spire just to the left is a monument erected “in gratitude for public service given to this town by Joseph Chamberlain“. I was not impressed by that news because “…..he was the chief advocate and supervisor of the Anglo Boer War (1899–1902)”. Moving on, I headed towards the Hall of Memory, which only opened at 10H00. I was 15 minutes too early and would have to come back to it. The odd latticework on the building to the right of the image above is that of the Birmingham Library, with Baskerville House to the right of it in the second image below. It was now time to head on my way and I turned around here, walked past King Edward VII and turned left. Only to discover that they were building a road in the middle of a street! These were the sort of roadworks that never finish, that keep going until roadworks are acknowledged as the status quo for that particular road, and people become resigned to never getting anywhere and stop using it altogether. Fortunately, I was not in a vehicle and I continued on my merry way until I hit the road that I had to go up. I had to head up to a roundabout ahead and split off onto Newhall Hill, and then Frederick Street. But somewhere between when my map was created and today something had changed and I ended up taking the wrong road, which was not that big a disaster as it turns out because I still ended up where I had to be albeit slightly too far to the left! The pretty building below really looked like a church to me, but it turns out that it is the Spring Hill Library. I turned right at this point and my destination was a 0.5 km further on. The cemetery is known as Warstone Lane Cemetery, and the reason that I was here was because I had read something about the catacombs that existed in the cemetery. It was also quite an old one, so the odds were there would be a lot of great headstones and statues. There are 51 First World War burials and 13 Second World War burials in the cemetery. A screen wall with a Cross of Sacrifice is situated near the old lodge and it commemorates by name those whose graves are not marked by headstones. The cemetery is in a poor condition, it is not fenced, there is a lot of litter and there has been a lot of vandalism in it judging by how many toppled headstones I saw. The catacombs had been cut into the side of a sand pit and were on two layers. A large chapel had above the catacombs, but it had been demolished a long time ago. The catacombs had been bricked close too, as they did have somewhat of a bad reputation. It was a pity though because this could become a very popular place. It is also worthy of a blog post of its own, and I will also be returning back here as there is a VC grave that I am looking for. A bit further down the road is a similar cemetery called Key Hill which I visited in mid April and it did not disappoint. My cemetery visit completed, it was time to head off towards my next destination which was a large square of green on my map. The area where I was now was called “the Jewellery Quarter“, and I really did not have too much interest in it, although a very nice clock did catch my eye. Oddly enough it commemorates the visit by Joseph Chamberlain to South Africa. Presumably to see the havoc that the Boer War caused. The green space on my map was occupied by St Paul’s Church, and it was a pretty one, dating back to 1779. Oddly enough it was more like the churches that I saw in Dudley than those I saw in Basingstoke, Salisbury and Southampton. The church interior was very beautiful, but it was not as overly decorated as some that I had seen before. I did like the family pews though, it was the first time that I had seen them. There is a large graveyard and there is a crypt under the church although the organ now blocks the entrance to the crypt. From St Pauls I headed towards the station area, passing one of the canals that run through the city. Next time I am out this way I am going to investigate these canals a bit more, and find where the narrow boats are hiding. The canal also heads under this railway archway which leads to Snow Hill Station, which is now a terminus for the light rail that runs from Birmingham to Wolverhampton. St Chad has a cathedral here too, and I went to see whether it was open during my second visit to the city, but unfortunately it was not. I did however get a pic through the door. Passing back under the railway arches a bit further one, I found an area that seemed to have a lot of the original tilework in place, as well as an interesting bit of history. I also spotted another piece of railway history still existing outside the station. Snow Hill was once the main station of the Great Western Railway in Birmingham, and this entrance in Livery Street still exists, although closed off. My quest for New Street Station continued, and I saw a lot of really old and pretty buildings, surprisingly most were in a good condition. The oldie above is the Birmingham and Midland Eye Hospital, founded in 1823. So far Birmingham had impressed me. It was clean, a bit confusing layoutwise, but there were those handy maps on a lot of the major intersections which really helped with my navigation. I was not using the phone because the Google Maps app is becoming increasingly more difficult to use with my small screen. Unfortunately a modern monolith detracts from the old magnificence around, but if it has an upper deck viewing area it would be really worthwhile visiting. My next destination was Birmingham Cathedral, and to be honest I did not even think of it before, but my time was still adequate and I could easily spare a few minutes to look around. .It is not as grand as Salisbury or Lichfield, but is a pretty building in its own right. 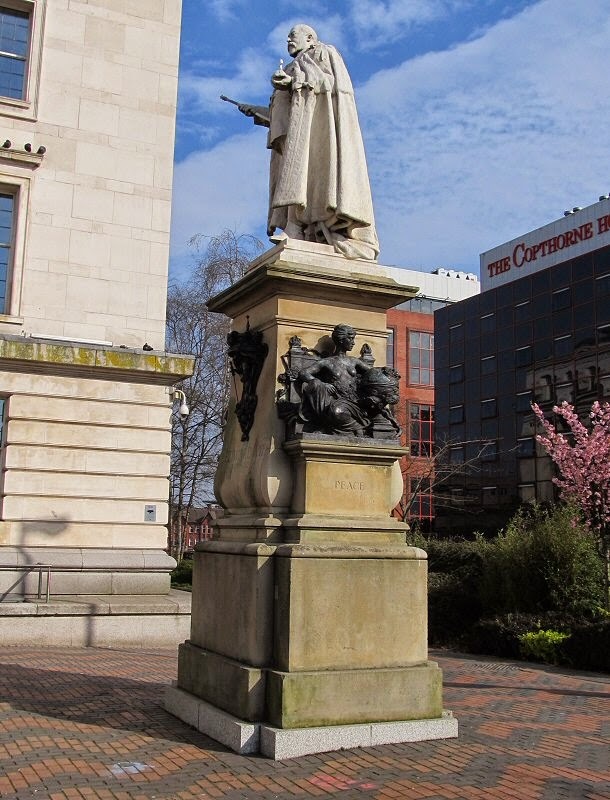 The church was known as St Phillip when it was consecrated in 1715, although at the time Birmingham was really a small provincial town as opposed to the second most populous city in the UK that it has become, and the church has become a cathedral as a result. The cathedral does have a really big graveyard, although most of the headstones are long gone or ploughed under. It would be interesting to know just how many people are buried around this building, and, how many are buried beneath it. I was now ready to return to the Hall of Memory, and I covered that in my allatsea blog. My time was drawing to a close here and I really needed to think about home. I had been very impressed by what little I had seen of the city, although I suspect in the height of the industrial age it was much dirtier and grimy, although possibly less crowded because it seems as if in the 3 hours that I had been on my travels everybody had come outside to enjoy the spring day.